"Do everything you can to ensure the future of the people and the country." Rabbi Drukman sees his main occupation as an educator and teacher of Torah. His natural environment is the house of study, lecturing his students. Nevertheless, much of his public activity was in the Knesset. 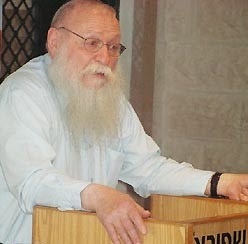 Rabbi Drukman was a member of Knesset for the National Religious Party, and for a certain period he resigned and founded the ‘Moreshet’ faction. "Serving in the Knesset was for me like doing reserve duty [in the army]," he says, "Every Jew is expected to do reserve duty. I didn’t want to be in the Knesset; I wasn’t looking for a public position, but I was called, so I went." This public service was indeed forced upon Rabbi Drukman. One day, near Passover, Rabbi Drukman traveled to Jerusalem to bake matzot. He was already aware that some activists wanted him to run for the Knesset, and the natural address to make that happen was Rabbi Kook. He rushed to the home of Rabbi Zvi Yehuda to tell him that his mission is to educate, and that he has no desire to go to the Knesset. Rabbi Zvi Yehuda listen to his words, but a few hours later he was called again to the rabbi’s home in the Geula neighborhood. "I went in and found those who wanted me to run for the Knesset were there. Rabbi Zvi Yehuda had listened to them, and told me I should go for it. When he said that, I burst into tears, but I accepted his ruling." The Rosh Yeshiva traded the Beit Midrash for the Knesset, but managed to continue at the same time to teach Torah. Do you think that rabbis should intervene in politics? Is the role of the rabbis limited to the Beit Midrash, or in all walks of life? "The bottom line is that it depends on who it is," says Rabbi Drukman. "Ideally, Torah personalities should be found everywhere, but it’s not always appropriate. I don’t think that just because someone has been ordained as a rabbi it makes him qualified to deal with every subject. But if there are Torah personalities who could lead the public not only in the synagogue but also in the Knesset, the fact that he is also a rabbi is not a detriment. In fact, it is even a bonus." Rabbi Drukman doesn’t only expect Torah personalities to serve in the Knesset, he also also expects a political united front for religious Zionism. The current split, he says, does not add much respect for the Torah of Israel. "Religious Zionism should be cohesive, and [if so,] its political representation will be in proportion with its real power," he says. "There are religious people integrated into the larger parties, and one reason for this is our success in education. Some people who grew up in the religious Zionist camp think there is no longer any need for a sectorial political party; that it is possible to exert influence in every party. I think they are wrong. Experience shows that a religious person in another party can influence society only an individual, but not collectively. The State of Israel needs a large religious Zionist party, where everything is rooted in the value of a Torah that is connected to the People, the Land and the State of Israel. This is the image of a true Torat Eretz Yisrael. This [unified political camp] will bring great blessings for the Torah and for the country as a whole. The present situation, where there is no unified religious Zionist party, is felt in many ways." One area where Rabbi Drukman has a lot to say is conversion. In 2003, with his leaving the Knesset, Rabbi Drukman began a new role as head of the state’s conversion authority in the Prime Minister’s Office. His [relatively liberal] attitude toward conversion upset the Haredi public officials, which came to a head when Rabbi Avraham Sherman, a judge on the Rabbinical Supreme Court ruled in 2008 that the conversions of Rabbi Drukman should be revoked immediately. He soon became a persona non-grata among the ultra-Orthodox community, which was clearly demonstrated when he visited one day the well-known Itzkowitz Shteibel (synagogue) in the heart of Bnei Brak. "I entered one of the rooms of the shteibel and besides me there were eight Jews. When the tenth man showed up, I said, 'We have a minyan (quorum), you can start [the prayer service].' But then someone said, 'You cannot be counted in a minyan; we have to wait for one more.' I remember I was so shocked, that I couldn’t manage to pull myself together until another Jew came in and we began to pray. If it wasn’t so painful and distressing, it would have been funny. I can’t be counted in a minyan?!" But the ultra-Orthodox community, in their eyes at least, is motivated by fear of Heaven. They object to your method of conversion. "Even if someone thinks otherwise, those who practice a second method have a basis in Halacha (religious law). How can you cancel out-of-hand all these conversions if they were made in accordance legitimate halachic opinion you can trust? Moreover, the judge who rejected my conversions announced his decision in public, at a convention of rabbinical judges, clearly mentioning my name, without having talked to me even one word beforehand. How can a judge rule without hearing all sides? How can he offhandedly mention my name, in a forum of hundreds of rabbinical judges, without first having consulted with me? How is it possible to speak about me in such harsh and sharp language? Is this proper? Is this the way of the Torah?! " What does this story show us regarding our relations with the Haredim? "Our relationship should be like a family. We are all one big family, which has a difference of opinion, but with love. What unites the people of Israel is far greater than what separates us. We say in the Passover Haggadah, “In every generation they try to destroy us." For those who are trying to destroy us, there is no difference between religious and secular, between leftists and rightists. We need to learn from our enemies that we need to be united. Certainly we have a [religious] lifestyle in common with the ultra-Orthodox, although I am sorry to say that I am not sure they think so. You can see this in their newspaper: any Haredi politician, no matter how small, who is elected to the Knesset, is referred to as a great ‘Rabbi’, even if he has no rabbinic qualifications, whereas when writing about our [religious Zionist] rabbis, they omit the title altogether. In our study halls you can find all the books of Torah erudition, but in the Haredi study halls you won’t find any books written by giants of Torah who were Zionists. Can you name one Haredi yeshiva with the books of Rabbi Kook on the shelf? Not books of Jewish Thought, nor books of Jewish Law. My heart aches, but it does not change the fact that we are a family. I'm not saying it's easy, but you have to overcome the difficulties. I would hope that if ordinary Haredim would recognize us as we are, it would be different. You have to get to know one another. Our Haredi brothers and our secular brothers have to get to know us and we have to get to know them."